states on Date 28 May 2007: …Sometime between 19:45 and 20:00, Neil and I left the apartment and went to the Tapas restaurant. We ordered our food and had a drink whilst waiting for the food to arrive. We returned around 20:15-20:30. We returned the Berry apartment and all of us ate on the veranda. After 22:00 we were still sitting on the veranda in the Berry apartment. We heard noises downstairs and afterwards found out that a child had disappeared. 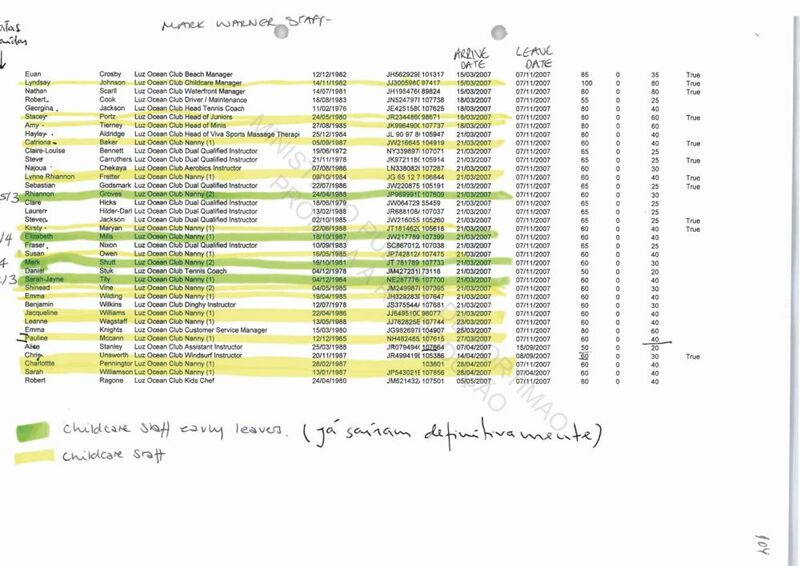 My testimony dated 6th of May 2007 related the details of the conversation we overheard and the information regarding the paper that Neil and I used in the searches. I cannot add any more details save those which have already been given in this testimony. Question: Where is the testimony dated 6th of May 2007 related to the details? Its seemingly not in the PJ-files on the web. Answer: No one knows why his statement is withheld. We do know that the PJ has withheld certain statements as told by Goncales Amaral. Question: It seems he met Gerry after 22:00, say not later than 22:15 to 22.30? Not much after the Smith's Sighting. The details (clothes, pictures?, behaviour…) could be of importance. In the Tapas-timeline first one, the Name Ella was twice written and then deleted: Ella. Question: Who is “Ella”? Is it Rachel Oldfield? Answer: Ella is the daughter of Jane Tanner and Russell O'Brien. Question: Why was the name used twice, and then cancelled? The double use is seemingly not an onetime error, but a systematic error? Question: What can us tell the answer in accordance to the several systematic alterations between the two Tapas-timelines? It is interesting to note that CHARLOTTE PENNINGTON is missing from the nannies list! For more see: → PJ Files. It is also interesting to look at this Staff list → PJ-Files. Look at the 5th column. All employees have a number, but NOT Charlotte Pennington. Why is that? There has been speculation that Charlotte came as a nanny to one of the Tapas 9. This cannot be substantiated. Charlotte lived in Howick, New Zealand from when she was 18 months old. Kate McCann worked in a hospital in Howick, New Zealand in 1996. Catriona's Rogatory is confusing: “Kate went to get Madeleine from the Tapas Bar area and according to what I remember she was wearing sporting clothes and I assumed that she was practicing some form of athletics. It was around 15h25/18h00”. 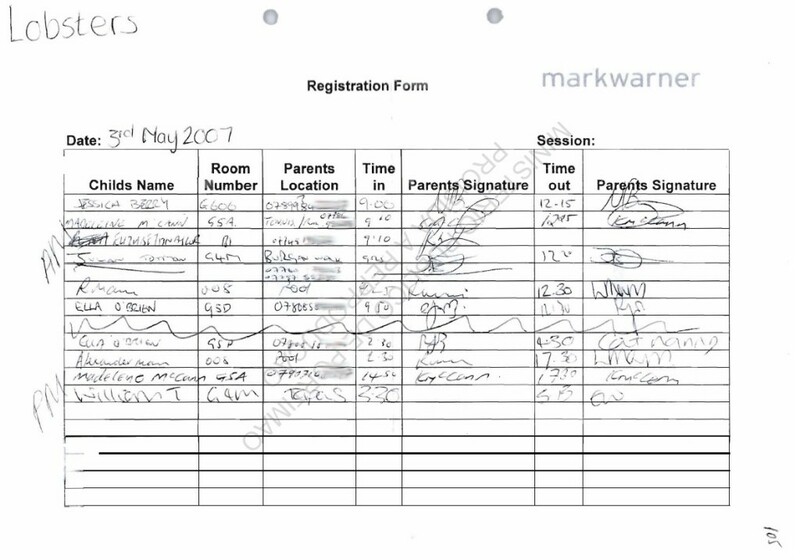 Non-independent witness David Payne claims to have seen Madeleine at 18.30 on the 3rd May. Kate said he was at the Apartment for 30 seconds (Kate's book Madeleine). David said he was there for half an hour. Why did they report the sighting three weeks after it occurred? More particularly on the same day that Robert Murat was made arguido. Did they help Scotland Yard with the E-fits? (Andy Redwood never mentioned the Irish family. The reporter did. See transcript of Crimewatch here: → BBC Crimewatch). If so, how did they do it, as Martin, Peter and Aoife stated that they would not recognise the person they saw from a photograph or in person.